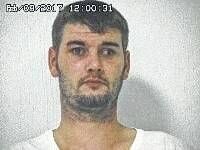 BUCYRUS — A man arrested by Galion Police and state marshals last week was arraigned in Crawford County Common Pleas Court on Monday. Joshua L. Prosser, 29, Crestline, was arrested at 111 Orchard St., Galion, on a Crawford County warrant in connection with a home invasion that occurred on Nov. 16, 2016. He is facing one count of aggravated burglary, a first-degree felony, and possession of drugs, a fifth-degree felony. Assistance from the U.S. Marshal’s office was requested due to the nature of the alleged crime committed by Prosser and past involvements and knowledge of Prosser,” Galion Police Chief Brian Saterfield said last week. Judge Sean Leuthold set Prosser’s bond at $500,000. If convicted, Prosser faces up to 12 years in prison. Richard L. Herzog, 56, Crestline, burglary, a second-degree felony, and misdemeanor criminal damaging, bond set at $250,000. Elijah B. McNeil, 28, possession of cigarettes not bearing stamps, and trafficking in cigarettes with intent to avoid payment of tax, both fourth-degree felonies, bond set at $100,000. Sean M. Haverty, 26, Marietta, possession of drugs, a fifth-degree felony, and possession of drug abuse instruments and possessing drug paraphernalia, both misdemeanors, bond set at $100,000. Laki D. Johnson, 22, New York, possession of cigarettes not bearing stamps and trafficking in cigarettes with intent to avoid payment of tax, both fourth-degree felonies, bond set at $100,000. Indigo R. McIntyre, 22, New York, possession of cigarettes not bearing stamps and trafficking in cigarettes with intent to avoid payment of tax, both fourth-degree felonies, bond set at $50,000. Christopher Meadows, 24, Belpre, possession of drugs, a fifth-degree felony, and possession of drug abuse instruments and possession of drug paraphernalia, both misdemeanors, bond set at $50,000. Ronald G. Selby, 48, Bellville, receiving stolen property, a fourth-degree felony, personal recognizance bond. Four cases are sealed until served and include five new charges.